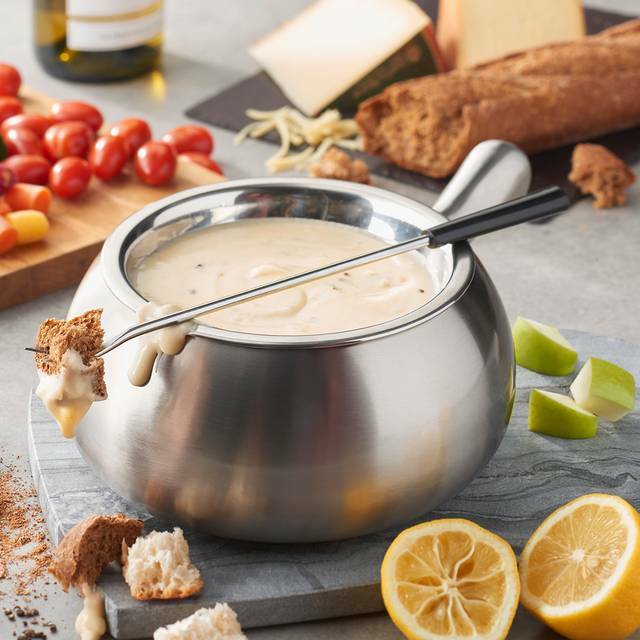 1/2 off cheese fondue, pure chocolate fondue, brie plates; & all salads. $5 well drinks & beer & $7 select wine pours. Service Appreciation Monday - we thank all of our service men and women with 20% off dinner on Monday nights! Kids Eat Free Saturdays & Sundays - From 4 to 6pm, one child 12 & under eats free per paid adult. See store for details or restrictions. 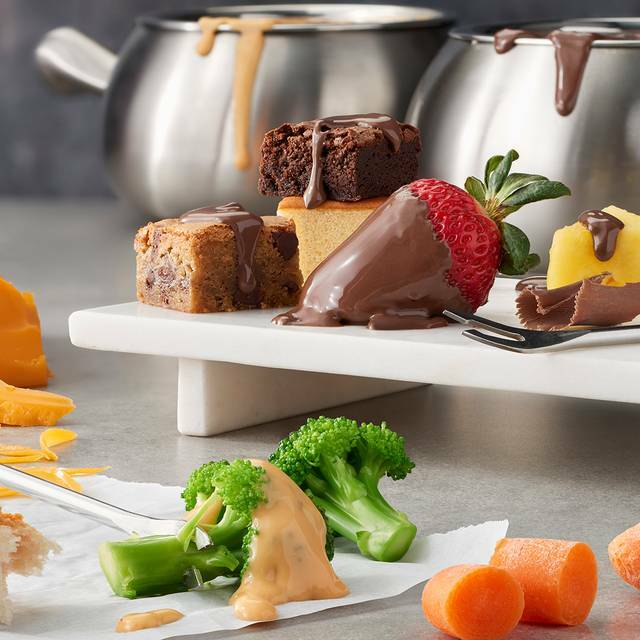 Kids eat free on April 278 from 11:30 am - 6:00 pm at The Melting Pot. Plus, a very special guest will be present from 11:30 am - 1:30 pm to delight the kiddos with his magical talents. Space is limited--book a table today! 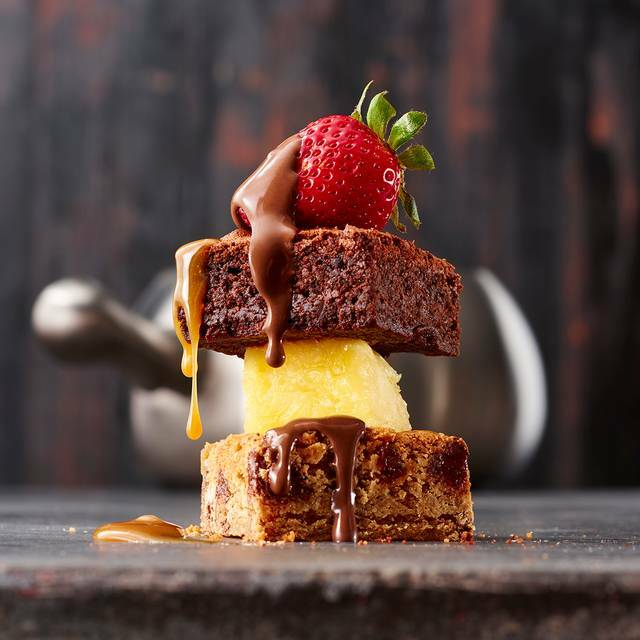 Gather your girlfriends for Ladies' Night at The Melting Pot! Happy Hour drink prices meet your choice of cheese, salad, and chocolate fondue, and a cocktail for just $25 - all night long, in our bar & lounge! Walk-ins welcome! 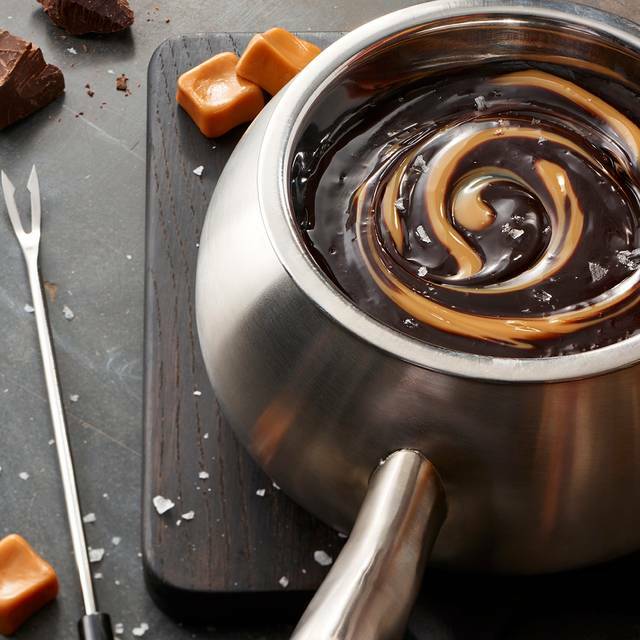 Dip in for Cinco de Mayo at The Melting Pot and enjoy a fun fondue special--2 for $32! 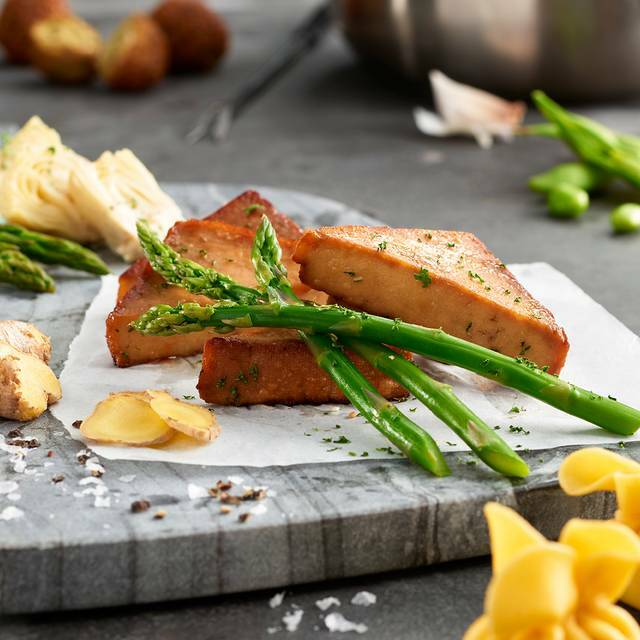 Enjoy two specialty margaritas and our Build-Your-Own Fiesta Cheese Fondue for only $16 per person. Book a table today! Our waiter Nick was great. The food was great as always... the staff could have done a better job at seating us... a table of 5 women celebrating, next to a table with a toddler. Not a good idea. The server was very slow compared to previous servers we have had. As much as I do enjoy The Melting Pot I do feel the the prices are a little over the top. Server Chloe was very nice and amazing. Food and dessert was wonderful. We went on restaurant week, so the price cheaper. The whole experience was fun and a great place to gather with friends. It was our first time going to the melting pot and we had the best time. From the time wensat down to the time we left we were attended to and all of our needs we're met. Our waitress went above and beyond in her service. We will definitely be coming back. 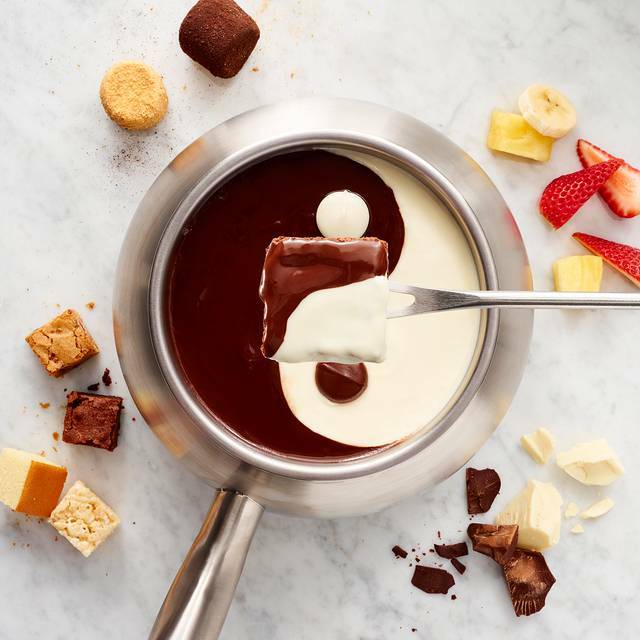 We used to go to the melting pot twice a year. We’d always order the four course meal which was around $50 per person for our favorite the land and sea. It came with filet mignon, chicken, pork, shrimp, lobster, pasta and duck. It was great! Over the past year the prices have skyrocketed and the portions decreased. For $64.99 we got chicken, pork, steak and shrimp. The cheese and chocolate bows were half the size they used to be and we ran out of cheese and chocolate before we did our dipping items. Drink that previously cost $8 are now $12.95, they’ve also added a 4% surcharge to ever bill. We were extremely disappointed and we won’t be returning. It was good food and fun but the service was really slow and seemed to be understaffed. Our server was fantastic. The service from the bar was horrible. Our drinks didn't come until we were on the main course! Our poor server was embarrassed that the bar was so backed up. I don't understand how you can understaff the bar like that. Otherwise a great experience. We went to the Melting Pot for my husband's birthday. We had a great experience! Our server, Ashley, was very attentive and helped us to navigate the menu and made some wonderful suggestions. I would recommend it to anyone celebrating a special occasion. After an hour and half I had to ask for our salads and refills on our water..... 20 minutes later I had to ask for the manager to get the process of getting our food. The table next to us had the same complaints. Our reservations were at 8:00 and we finished at 11:00 my husband had to leave at 10:00 to go to work. The Melting Pot is great but had the worst service from our waitress. We felt forgotten most of the time. Plus she forgot our drinks, didn’t even put in my friends drink order. Barely checked on us, so we had cheese to eat but nothing to dip into it. So we just sat there waiting for our waitress to remember to stop by.... Horrible service by the waitress. The value of the food was more appalling than what I had heard. Virtually no food for the amount I would spend on 6 people on full course meals. The food was amazing...what little we had. In the future explaining to your customers the amount of food they are going to receive would be very helpful....we split a four course between 3 people and were not notified that this was not going to work the way we thought. We told our waitress what we were doing and she didnt even hesitate or make any comment. I spent $210 on a meal with you- still hungry and left wanting more...when feeding 4 at any other resturaunt is maybe $100- and we are all going to be full and satisfied. I am gluten free due to Celiac Disease. This restaurant was a big deal on my Celiac board. The waiter had no idea what gluten free is, which I’m fine with. I’m a big girl. I ordered the Wisconsin Cheese which comes with GF beer. It tasted awful. When I brought it to the waiters attention his response was “it’s probably the gluten free beer”. So if that’s the case, we should replace the cheese & make the customer happy. Especially with spending as money as you are at this restaurant. That did not happen. Ordered my salad with no croutons & got them. Which is fine, honest mistake. The first salad was so pretty. The returning salad that came back was a bunch of wedges. I didn’t have time to discuss my experience with the manager & honestly I feel like a burden enough to my family & friends. That I just left it alone & left. We've been to melting pot many times but the service this time was by far the Best! The pay the date dinner is the best ever, my husband and I were both full from the smaller portions. I will be doing this again! We went to the kids eat free so I knew the noise level would be somewhat more then normal. I didn’t expect one parent to let their child roll back an forth on the floor, but your staff we awesome an didn’t trip over them once. My son also loved the magician, that was a great thing to have for this event. We learned thanks to our amazing server that we should now ask to swap broth for the white wine on our Alpine cheese selection. Which she diligently worked to fix so my son would eat it. On a side not we normally get the Alpine cheese one but I wasn’t paying attention this time and forgot to inform her to not add so much of the wine. The rest of our meal went amazingly, and thanks to being in Club Fondue I got to take home some complimentary chocolate covered strawberries. Thank you so much for another lovely time at your restaurant and can’t wait to come back in again soon. Excellent service and food. We got there early to have a drink in the bar but all of the tables (except 4) were empty and had papers saying they were reserved. We would have spent more money there on drinks but went somewhere else then came back for dinner. Lost revenue and poor management decisions! First time there. Celebrating our boss's retirement from the restaurant biz of 23 years. She took a few her favs out. The food, service and ambiance was fantastic! They even brought her a little plate that said happy retirement. I thought that was really sweet. It's the little things..we had a great time and I would recommend this ace to anyone. Great food, excellent ambience, definitely worth the price and drive!!! Thankfully each booth is partitioned well, so you can have a conversation. Our server was lovely. Our fondue course was excellent. The salad was my only criticism. It was small and boring. We chose to grill our meat course. Each had unique seasoning, which were delicious. 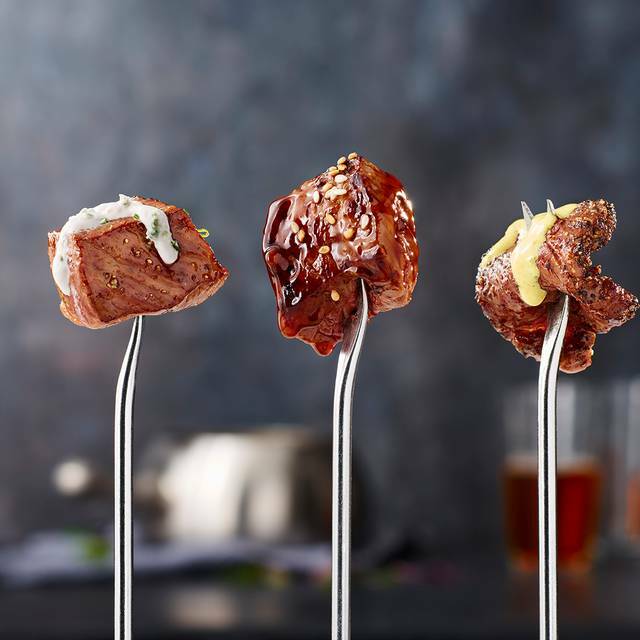 We felt the dipping sauces, although subtle, were unnecessary as the meats were flavorful in their own. Dessert was good too. I would have been happy with less variety of items to dip. Excellent, but with new rise in prices, we may no longer be able to afford it. Server, Chloe, was great! We were sat upstairs in the very last table even though the restaurant was pretty empty downstairs, so not much foot traffic. Staff was fairly attentive, towards the end of the meal we didn't see the waitress much. Food has stayed pretty much the same over the last 25+ years I have been dining at a Melting Pot, only the prices have gone up. I will come again, but not for a while. We had a really good waiter this time. We haven't been too often because service went down hill for a while but it was good this time! Great first experience. Celebrated my birthday!!! 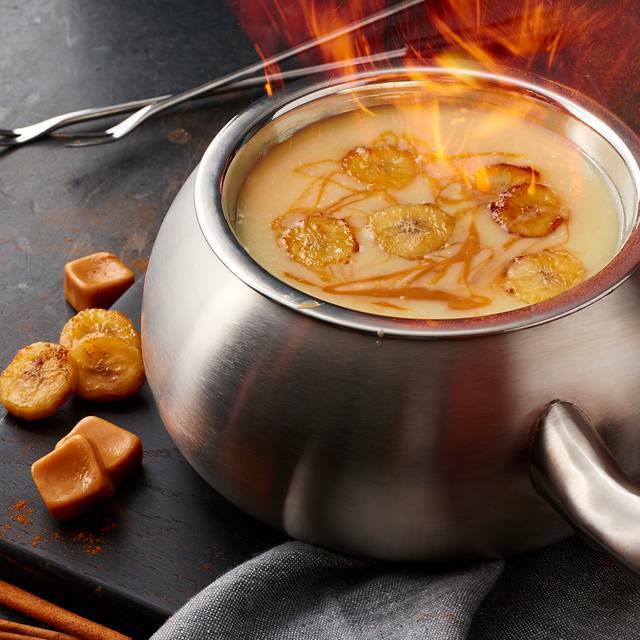 The food is ok, nothing outstanding, its just fondue. The service was poor at best. The amount you paid did not equal the quality of the food or the service, it is overpriced. I have been to a few Michelin star restaurants and did not pay as much as I did here. I would not recommend this restaurant because of the cost. Our server was very attentive and friendly. The food was amazing and the chocolate fondue is to die for, the dipping options were excellent. I will say, there was a weird feathery hair looking thing on one of my broccoli florets. It was small and hard to see but thanks goodness I spotted it before I ate it. I picked it out but we were turned off from the broccoli options afterwards. Overall great experience. Will be back!! We had a really great experience on Saturday. The food was delicious I’m a vegetarian and my husband isn’t but everything we ate was wonderful. We had a really sweet and efficient waitress named Kimberly who was really attentive and took great care of us. The blackberry lemonade was one of the yummiest drinks I’ve ever had, the Wisconsin cheddar fondue and turtle chocolate fondue were amazing. Salads were great too & I loved the California one. The vegetarian entree was wonderful & had tons of veggies like asparagus,potatoes, and zucchini as well as tofu and pasta. My husband loved his especially the shrimp & chicken. We had a lovely time and the staff were all friendly. We can’t wait to come back with our daughter! My wife and I recently made a reservation to The Melting Pot - Tacoma. I made this reservation for our wedding anniversary. When making this reservation I had made the request for "The Date Night Experience." However, when the day arrived, my wife received a phone call that they needed "more time" for our reservation. We agreed to make the reservation for later. When we arrived, we were sat at a regular table with none of "The Date Night Experience." We spoke with the hostess and instead of trying to make the situation right, she sat there and blamed it on their reservation program. Not only was this frustrating, but then we decided to stay and shake it off, the manager approached our table and again blamed it on the reservation program and "wanted to see what our reservation email looked like" which showed we had done the reservation for that experience, then he said "he just wanted to make sure he had bought enough roses for the day, for upcoming customers." This really was a slap in the face. Not only did they not offer to rectify the situation the manager came to the table and did not even offer a rose to my wife or to take any money off the bill. If we hadn't already ordered, we would have left. Now, the server was great and he did is best to make the situation the best that it could be. He brought us two glasses of champagne and some dipped strawberries. And honestly, we would have probably just been okay with this and brushed it off as a software glitch. However, to have the manager come to the table and not only question the reservation but then say "he just wanted to make sure he had enough stuff for incoming customers" was ridiculous! We do not recommend the Tacoma location. If you are going to spend the money either go to the Bellevue location or go elsewhere. Had a wonderful evening, the food was amazing , and the dining experience was memorable. Thank you! We love the melting pot! That being said, we had a very attentive server, but she seemed like she was more suited for a burger joint than a restaurant that we go to mostly for the experience. 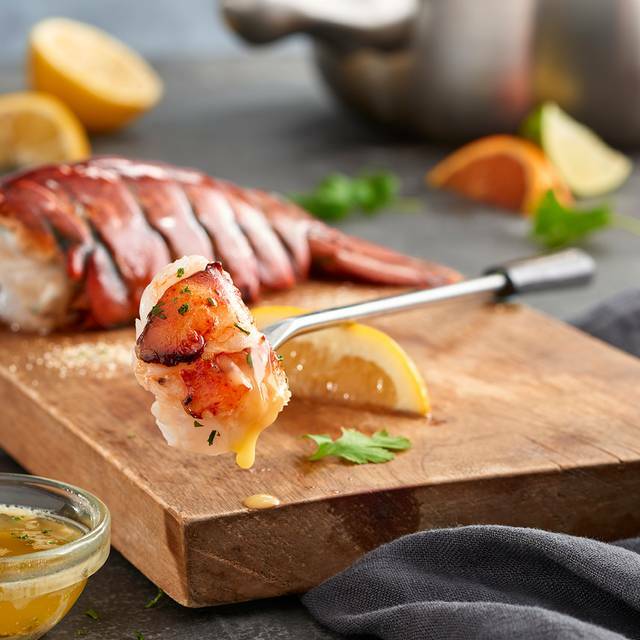 Presentation is important at a place like the Melting Pot because you know you are paying a premium for a somewhat small amount of food that you cook for yourself. We just went in November and ordered the same thing, and the manager came out to ask how everything was, making it feel like they really cared. But the price has gone up quite a bit since then, and no manager this time to see how we were doing... We will most likely keep coming back for special occasions as my wife loves the place. But they really need to have a more uniform serving method as it seemed this time like they were just going through the motions to get us on our way. Expensive for what the food was but good atmosphere and experience. Kind of a one time thing, probably will not return. I love their weekend lunch menu. It's awesome! We had a great experience. Thank you! Great venue for a couples date. It was hard with a bigger group and reaching over each other to cook your food was kinda awkward but we had a great time. It is a pricey venue so be prepared for the bill. The Melting Pot TOTALLY redeemed itself on 2/28 when I decided to take my husband out for a 'just because' date. Our server Nick was 'in the zone's and on top of everything. We used the 2 for 28 coupon sent to my email. And the food was amazing ! We'll for sure be back if service & food like that are 'the usual'.